There’s a new strain of c anine flu in the U.S., and it has some pet owners worried about their furry family members. More than 1,000 dogs caught the illness during a recent outbreak in Chicago, and infections are reportedly emerging in other states, including California. But the H3N2 canine flu — not to be confused with the seasonal H3N2 human flu that sickened so many people last winter — is no cause for panic, experts say. Most dogs won’t get seriously ill if they catch dog flu. What’s more, a contagious virus in dogs is unlikely to spread rapidly (as flu can in people) because dogs simply aren’t as mobile, or as social, as we are. There are two types of dog flu. The first, H3N8, is nearly identical to a virus that has been known for more than 40 years to infect horses. The virus adapted to dogs, first infecting them in the U.S. in 2004, according to the U.S. Centers for Disease Control and Prevention. The American Veterinary Medical Assn. reports that dogs that are sickened by canine flu fall into two categories: those with a mild form (causing coughing, lethargy and sometimes a nasal discharge) and those with a more severe version accompanied by high fevers and pneumonia. 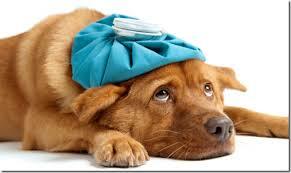 Some dogs can catch the flu and not have symptoms at all. “It’s the entire range, just like in people,” said Dr. Polina Vishkautsan, a UC Davis veterinarian. Although a vaccine is available for the H3N8 strain, scientists don’t know whether it would prevent H3N2 infections, Vishkautsan said. She said that she doubted it would, because of differences between proteins in the two flu types. Dogs at the highest risk of contracting canine flu are those that have the most contact with other dogs, often in such locations as boarding kennels, doggy day care and animal shelters. Both Vishkautsan and Parrish said they had heard reports of at least one confirmed H3N2 dog flu infection in Southern California, but they didn’t have details. “It’s mostly just common sense,” Vishkautsan said.